Denver Zoo's Zoo Lights, which runs from December 2-January 1, is the largest lighting event in the Rocky Mountain Region and the largest annual event hosted by the zoo. Guests of this popular holiday tradition, now in its 26th year, will experience a light safari with 60 brilliantly-illuminated acres of lights, featuring more than 150 animated animal sculptures that swing through trees, jump across lawns, hide in bushes and appear in places where they're least expected. Zoo Lights guests walk up to a herd of animated animal sculptures. Light up your holiday with a wild visit to Denver Zoo’s 26th annual Zoo Lights celebration. Presented by Your Hometown Toyota Stores, the Rocky Mountain Region’s largest lighting event will run nightly from December 2, 2016-January 1, 2017, from 5:30-9 p.m. Guests of this popular holiday tradition will experience a light safari with 60 brilliantly-illuminated acres of lights, featuring more than 150 animated animal sculptures that swing through trees, jump across lawns, hide in bushes and appear in places where they're least expected. This year, the event will incorporate the Zoo’s new traveling exhibit, “Washed Ashore: Art to Save the Sea,” presented by CH2M, which features 15 giant sculptures of marine life around the park made almost entirely from trash collected from beaches. Each of them will be lit for night-viewing, and for many guests, it will be a last chance to see them before the exhibit ends on January 16, 2017. Zoo Lights’ “Under the Sea” section, which includes lighted sculptures of sea creatures, will grow in size this year and move to the Zoo’s main gate. Even ice carvers will slice sculptures of sea life on the weekends. Eagle-eyed visitors should also be on the lookout for the event’s Gnome on the Roam. This special, lighted-sculpture of a gnome will move to a different location around the park, in a different position, each night. Guests are encouraged to make repeat visits to discover where he ends up. For many other reasons, this event promises a time like no other in Colorado. Festivities will include chances to meet Santa Claus, live animal demonstrations, carolers, singing princesses, instrumental groups, delicious holiday treats at warming stations throughout the zoo and the ever-popular Zoo Year’s Eve party. Sven’s Juggling Show will even dazzle guests with juggling of fire and glowing objects most weekends. Denver Zoo is now offering Value Night pricing, from December 2 to 15, to encourage guests to visit Zoo Lights on nights that are traditionally not as crowded. These reduced admission nights will offer an experience with fewer lines and more available parking, but still offer all the same experiences guests will receive on a Peak Night. Admission for Value Nights, without a discount, is $13 for adults (12-64), $9 for children (3-11), $11 for senior citizens (65+) and children 2 and under are free. From December 16 to January 1, admission will increase for Peak Nights to $17 for adults (12-64), $12 for children (3-11), $14 for senior citizens (65+). Children 2 and under are still admitted free. The Zoo will also run a shuttle during these nights, from the 40th and Colorado light rail station, to encourage guests to take alternative transportation. Zoo Lights is the largest lighting event in the Rocky Mountain Region and the largest annual event hosted by Denver Zoo. It takes Zoo staff members three months to set up the 60 acres of lights and displays and almost the same amount of time and manpower to dismantle them. Members get a $2 discount on all tickets. The Zoo will also offer a $2 online discount on all tickets to help guests avoid long lines. 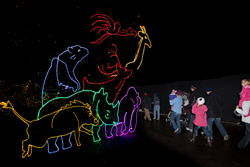 For more information on Zoo Lights, please call Denver Zoo at 720-337-1400 or visit http://www.denverzoo.org. Be among the first guests to enjoy this year’s Zoo Lights event at the special preview weekend, right after Thanksgiving. Our regular Bunk with the Beasts program lights up with holiday cheer. Get a sneak peek as a family at the “Wild Lights, Wild Winter” Family Bunk on November 19 or ring in the new year at the “Zoo Year’s Eve Kids-Only” Bunk on December 31. Explore how wild animals adapt to winter habitats, enjoy Zoo Lights, and then, just like our animal residents, sleep overnight at the zoo! Sign up at http://denverzoo.org/classes-camps/overnights-family-and-child-only or contact Denver Zoo at guestcare@denverzoo.org or 720-337-1400. Get up close and even touch animals from around the world inside Benson Predator Ridge on every night throughout Zoo Lights! Visit a special ice carving garden, filled with animal sculptures created by Santa's helpers with power tools, with a special focus this year on sea creatures. Naughty and nice children alike can bring their Christmas wish lists right to Santa and take a picture with the big guy himself before he flies home for his annual trip! Join us on December 31, 2016 for Zoo Year's Eve during our Zoo Lights celebration. The evening features fun activities for the entire family and an early New Year's Eve countdown at 9 p.m. so your little ones can enjoy the holiday and still get home for bed early. About Denver Zoo: Denver Zoo brings informal science education alive, providing a unique learning experience that sparks an interest in the natural world for visitors and program participants alike. Home to 4,000 animals representing more than 600 species, the Zoo is accredited by the Association of Zoos and Aquariums (AZA), which assures the highest standards of animal care.